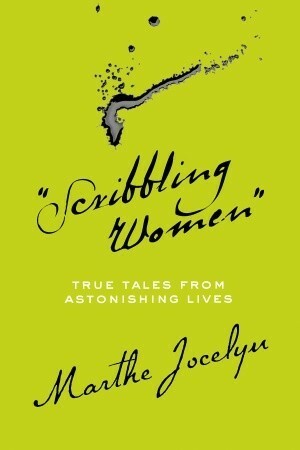 Lost in a Good Book: "Proof that 'I was here, and I made my mark' "
I loved Scribbling Women by Marthe Jocelyn. I have always been interested in looking at different historical events and periods of time through the perspective of women so when I first found out about this book I was immediately interested. This book was fantastic! One of my favourite things about it was that I had never heard of any of the eleven women whose stories were told and yet as I learned about each of them, I found myself wondering why on earth hadn't I heard of them?? Each have such amazing stories to tell and have had some sort of historical impact on the world we live in today. Take Nellie Bly for instance; she was the first female undercover reporter! The things she did to get her story are incredible, especially when you consider that she was the first one to do it! And Daisy Ashford; she was an author who stopped writing at the age of 14 and whose novel The Young Visiters is still in print and popular today! After reading this book, I have found myself with a large list of books that I now want to read so I can found out more about these 'scribbling women'.